Flax seed meal is made by grinding whole flax seeds into a crushed powder. 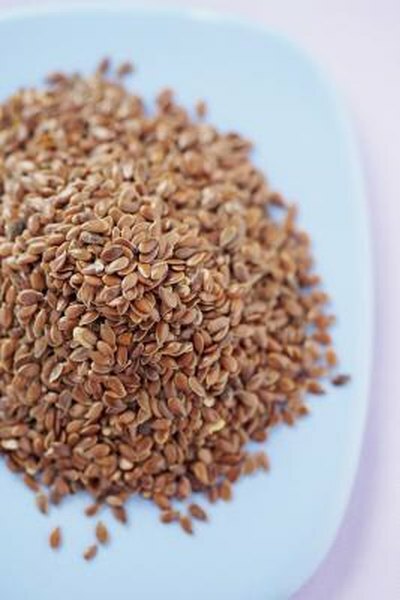 Flax seeds are very nutritious, containing important omega-3 fatty acids as well as protein, vitamins and fiber. Flax seed meal is more easily digested than whole flax seeds, allowing the nutrients to be absorbed into the body instead of passing through if the whole seed remains intact. Flax seed meal can be incorporated into almost any recipe. Choose a recipe to prepare with flax seed meal. Nearly any recipe can easily incorporate flax seed meal, especially entrees, appetizers, breads and muffins. It may add a slightly nutty flavor, so take that into consideration when you choose your recipe. Determine the amount of flax seed meal to add to your recipe. One serving is two tablespoons. If the dish you are preparing makes four servings, you need to add eight tablespoons so that one serving of flax seed meal is incorporated into each serving of the recipe. Place the appropriate amount of flax seeds into your coffee grinder and grind into flax seed meal. You can also purchase already ground flax seed meal in health food stores but it goes rancid more quickly once ground and the nutritional value diminishes if not stored in the refrigerator or freezer. Add the flax seed meal to your chosen recipe. If making bread or muffins, incorporate the flax seed meal in with your dry ingredients. It can also be used with breading for oven baked chicken or fish. It can be mixed into stir fry dishes at the end of the cooking process. Alternatively, you can sprinkle the flax seed meal over finished dishes to add a nutty flavor and nutritious finish. Add flax seed meal to soups or stews while cooking. As the flax seed meal cooks, it will aid in thickening the soup or stew.